Florida’s leading business publication, Florida Trend magazine, recently set out to identify the State’s 500 most influential people. They hail from 60 different sectors, from businesses small to large. 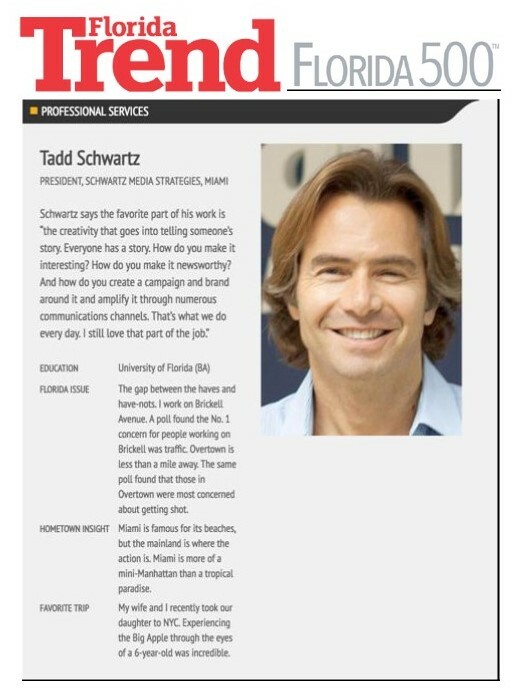 Our president, Tadd Schwartz, was fortunate to make the inaugural list. When asked about the most pressing issue in his home state, he answered, “It’s the gap between the haves and have-nots. I work on Brickell Avenue. A poll found the number 1 concern for people in Brickell was traffic. Overtown is less than a mile away. The same poll found that those in Overtown were most concerned about getting shot. You can read Tadd’s entry here, and peruse the full Florida 500 here.